Home About Us Menu News and Recipes Jabo's Utah "SCONUTS"
started his business from a small rock house in Mcloud Oklahoma in 1950. 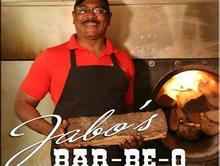 Folks came from all over to get the great taste of Jabo's Bar-Be-Q. Jabo's son, Dwight, now known as "Jabo", continues this legend in Greenwood Village, which he started back in 1992. Jabo has expanded the recipe to include several tantalizing flavors of sauce. All of which are made from scratch. We at Jabo's hope you enjoy all of these delicious flavors that expand well over 22 different flavors. Pit Master and chef for over 50 years. Jabo brings his true talent to all his recipes. Born in Oklahoma with a family recipe handed down to him from Louisianna, Jabo has had this business in operation since 1992, which was located on the Five Points. He is a true master when it comes to smoking meats and crafting his many sauces. He is also an ordained Church of Christ Minister and being so busy with church and business he always will find time to make you feel right at home and teach you a thing or two about the art or smoking. Susan is best known for her scones. Susan, Jabo's wife, has been a chef for over 40 years. A graduate of Hotel and Restaurant management, she brings a creative flare to Jabo's with all her homemade desserts, breads, and varieties of honey butter. Her family has deep roots in Utah with quite a few famous ancestors. The famous "Utah Sconut" recipe is one of the many things handed down to her through generations. Susan has added her own twist to this already dilectable treat to make it her own.